I am so happy that you joined us for the celebration of Christ's birth. I understand that many of you may be visiting. For some of you this may be a renewal, a moment that has brought you back to church. What ever the reason or where ever you may be on your faith journey I want you to know you are always welcome here at St Magdalen's. There are so many wonderful staff and ministry leadership that are always eager to listen and spend time with those who are seeking more for their faith. Please let us know how we may be part of your journey. November 20th marked the close of the Year of Mercy. To acknowledge this moment in the Church, Bishop Checchio honored 107 individuals from around the Diocese of Metuchen who exemplified the mercy of Christ in a particular way. 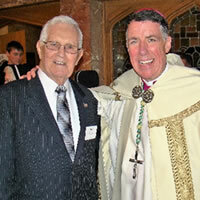 Tom Jeffas, a member of St. Magdalen’s Church, was one of those recipients to receive the ‘Disciples of Mercy’ award. Tom was honored for his work with the Hope House and the St. Vincent de Paul Society. On November 19, 2016, over 3000 people from the Diocese of Metuchen joined Bishop Checchio to celebrate the 35th anniversary of our diocese at the Basilica of the National Shrine of the Immaculate Conception in Washington, DC. 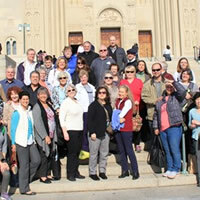 Forty people from St. Magdalen's took a bus for the all day trip. The pilgrimage was extra special because it was on the eve of the closing of the 'Year of Mercy'. I was raised Catholic-attending St. Magdalen’s Church when it was still located on Park Avenue. I served as an altar boy and can still remember polishing my shoes in preparation for Sunday Mass. When I was 17, I enlisted in the Navy and at 18 went to Vietnam-I was a hospital corpsman, in the Fleet Marine Force on my 1 tour and a ‘special warfare’ unit in my other 1 and a half tours. My job was to rescue and treat wounded marines, team mates and civilians. I saw some very ugly things in Vietnam—many of which are etched into my memory. I was wounded on three separate occasions, low-crawling through machine gun, rifle fire and artillery-seeking to save the lives of men in my unit. 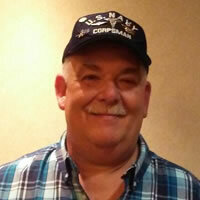 My best friend, a radio operator, was one such person who I was unable to save. Because of the atrocities of combat, I found myself losing faith in God. I asked, “God, why? Why did you take him?” This loss of faith, I have found, is very common in war veterans. As a result, I was away from the Church for more than 30 years. After going through the inpatient PTSD unit at VA Hospital as well as Outpatient I felt a little relief from the nightmares, but my Faith was still lacking. So I sat in the back of church, right by the door, and no one noticed me. Curly hair, black pants and boots, blood red lipstick. And still, no one noticed me. Some people made brief eye-contact, but did not recognize me. My entire 8th grade CCD class walked right next to me and no one even looked over. And I thought, "This is how Satan gets the job done. They don't even know I'm here." I was waiting, of course, for the performance of "Back From The Dead: The Last Four Things" to begin, and I was playing the Devil.